Want to make the most of your web pages? Need to stop wasting clicks and turn more visitors into leads? Then you’ve come to the right place. Our team of conversion rate experts will design landing pages that make your customers happy and maximise your site’s performance. At Mitra, we design custom-made landing pages with one goal in mind – to increase conversions. Whether you need to increase sales or leads, we’ll give you a page that does the job. Our friendly team will do all the hard work for you, so you can save time and money. Choose us, and we’ll analyse the data, prepare test plans, build your page and write professional copy. How Do We Build Landing Pages? You’ll tell us your goals, and we’ll plan carefully, carry out research across the landscape (including your competitors, so you can be one step ahead! ), write sales-driven copy, and use tried and tested conversion methodology. We’ll also provide you with regular updates, so you can be sure your landing page will match your brand and meet your business goals. Once the page is live, we record conversion data and communicate this with you, so you have real results on how performance has improved. We’ll also test various copy, colours and layouts, so we can guarantee your page is doing the best it possibly can. Nowadays, mobile devices are big business – but so many companies are still missing out! Your landing pages need to be optimised for desktop and mobile, to give all your customers the best experience possible. 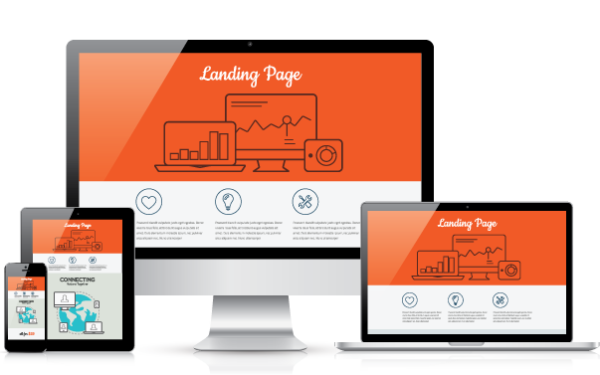 Our dedicated team will make sure your landing pages are fully responsive so that they display well on smartphones, computers and tablets. Ready to boost your sales and leads? Then give us a call now, and we’ll arrange a free, no obligation meeting with one of our landing page specialists.